after the plane hit the Atlantic. The child was never seen again. Rachael K. Hoopii, 32, of Waimanolo, Hawaii was on her way with two children to join her husband in Munich, Germany. Mrs. Hoopii and her little girls, Uilani, 10, and Luana, 6, were all eager to see the family together again. Tech. Sgt. Bernard Palinapa Hoopii, 36, of Wailuku, was energized, excited for his family’s arrival. He was a veteran of 12 years of Army service, which included action in Korea. He had been separated from Rachael, Uilani and Luana for the past two years. Bernard and Rachael had been married for six years. The three Hoopii women were headed to the reunion by way of the Military Air Transportation Service (MATS) on Flying Tiger 923. They never got there. They all died that night, in the frigid, gale-whipped waters of the North Atlantic, 500 miles off the coast of Ireland, on September 23, 1962. There was no news of the dead in far-off Hawaii until five days after the disaster, on September 27. The Honolulu Star-Bulletin newspaper finally carried a front-page report of sorrowful deaths of the two children and equally sorrowful story of the likely final pleas from the mother, desperately alone, seeking refuge on the raft. 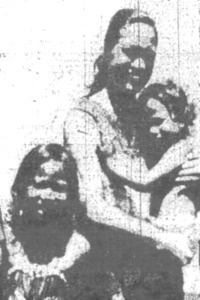 Another Paratrooper, Private Frederick G. Gazelle, of Pasadena, California, said he tried to save a woman he believed to be the children’s mother. “I held on and she kept crying, ‘Please let me up.’ But they kept on coming over and around us. I found myself under a pile of men and I could not hold on. The woman disappeared.” The sea never slowed its rage. Army Sergeant First Class Alfred Bodung, of Indianpolis, Indiana – one of the survivors flown days later to Cork, Ireland, and then to Oxford, England, for medical treatment – said he had been “detailed” to look after the children as the plane came down. According to earlier reports, he had been given the impossible assignment by Stewardess Jacqueline Brotman, 24, who perished in the crash. Bodung said he found the raft, which became so crowed that people were lying and sitting on top of each other. He got in, sandwiched between other survivors and prayed. He said the next five hours until rescue by the Celerina, were the most terrible hours of my life. And that was the end of three Hoopiis, gone in the cold, wet darkness. Perhaps by fate, another Hoopii daughter (by a previous marriage), Roberta Kanani Mokilehua, 13, had originally left home for the trip with her step-mother and two sisters on August 28. They made a three-week stop over in California to visit relatives on the mainland. Roberta disliked the early September California cold so much, and got so homesick for Hawaii that she returned to the islands on September 3, some 20 days prior to the doomed flight. She was staying with her grandmother, Mrs. Robert Kekauoha, in Waimanalo, at the time of the crash. Mother Rachel was one of six children. She was born on Oahu and went to Waimanalo Schools. She had long wanted to join her husband in Germany, but had to wait until restrictions were lifted on relocation of dependents. The trip to Germany was her first trip away from the Hawaiian islands. Tech. Sgt. Hoopii was a native of Hana, Maui. This entry was posted in passengers and tagged Flight 923, Hoopii, lost at sea, Rachael Hoopii. Bookmark the permalink.